For advanced control and external broadcast live detection, requires the RTMP Session Control feature including with our Wowza hosting plans and available for licensing on 3rd party servers. Who can broadcast is subject to membership and administrator can allow all members or only a certain list (usernames, emails, roles) to setup channels. Our solutions implement special features for mobile users because plugins like Flash and RTMP camera streaming are not supported in mobile browsers. WebRTC in some HTML5 browsers (including Chrome Android, Safari iOS), with specific hosting requirements. HLS or MPEG DASH after transcoding. Our Wowza based plans support this functionality. WebRTC in some browsers, with specific hosting requirements. * Each technology and implementation has specific limitations and requirements. 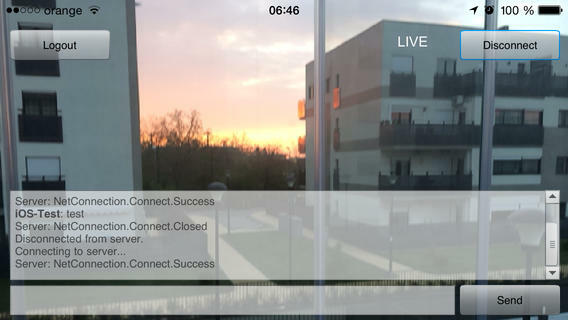 HTTP Live Streaming (or HLS) is an adaptive streaming communications protocol created by Apple to communicate with iOS and Apple TV devices and desktops. All iPhone/iPad devices running iOS 3.0 and later support HLS. Devices running Android 4.x and above will also support HLS. Dynamic Adaptive Streaming over HTTP (DASH), also known as MPEG-DASH, is an adaptive bitrate streaming technique that enables high quality streaming of media content over the Internet delivered from conventional HTTP web servers. Similar to Apple’s HTTP Live Streaming (HLS) solution, MPEG-DASH works by breaking the content into a sequence of small HTTP-based file segments. The VideoWhisper Live Streaming plugin supports configuring a HLS / MPEG DASH delivery url (available with Wowza Streaming Engine rtmp hosting). To play on iOS, streams need to be published (usually with external encoders) with certain codecs and profiles supported by iOS devices. Web based Flash plugin and mobiles apps built with Air do not publish in a format accessible on iOS, because this Adobe technology does not support AAC codec encoding and often video bitrate/profile are too high for mobiles. Publishing from a Flash / Air based client to HLS (iOS or Android browser) requires transcoding of stream (live re-encoding) by relay server before delivering as HLS. Transcoding is supported by this solution. Transcoding for all incoming streams can be enabled with the Wowza Transcoder addon on dedicated servers with Wowza Streaming Engine or FFMPEG on shared Wowza based rtmp hosting plans. Solution implements specific FFMPEG transcoding depending on stream source and encoding, to make cross device streaming available. Import and show archived video streams using Video Share VOD plugin. Plugins allows controlling access for broadcasters and viewers, including globally (with access lists), using membership levels (for broadcasters and their channels) and per channel by broadcaster. Use myCRED credits management and billing plugin to enable pay per access channels. Clients can prepay credits that can be used for purchases on site. Plugin includes PayPal Standard, Skrill (Moneybookers), NETbilling, Zombaio, BitPay (bitcoin). Other payment modules are available for extra: 2checkout, ComproPago, CoinBase, CoinPayments, PayFast, Payza, Robokassa, Stripe, WePay. Use WooWallet to support WooCommerce billing gateways (free & paid): PayPal (Standard, Checkout, Stripe (CC, Apple Pay, Google Pay, SEPA, Bancontact, Sofort, Giropay, EPS, iDeal, Przelewy24, Alipay, Multibanco), Square (CC U.S, Canada, Australia, Japan and the UK), Amazon Pay, PayFast, Venmo, eWay (SG, MY, HK, AU, NZ), Klarna (now, later, slice), Authorize.Net, SagePay (UK), WorldPay, PayPal Pro, Advanced (Payflow), Elavon, Moneris, FirstData, Payson, Pin Payments AU, 2 Checkout, SnapScan SA, Alipay CN, PayU TK. 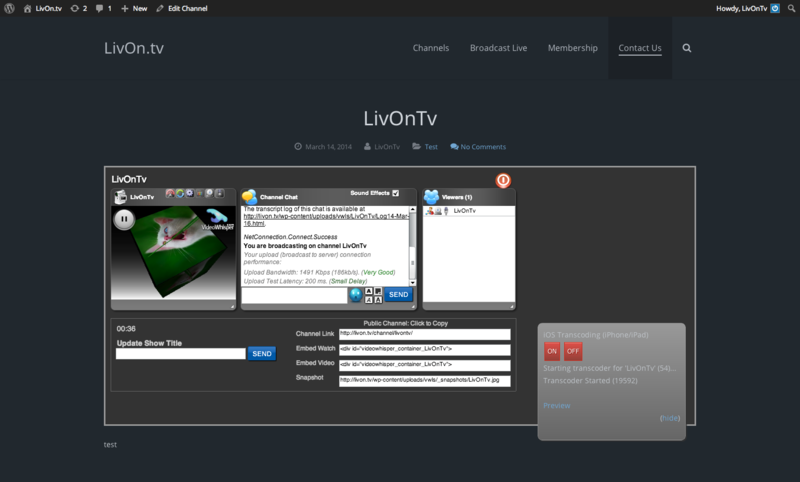 As WP Live Streaming plugin supports premium broadcasters and access lists based on roles, this can be used in combination with the credits based Paid Membership plugin, (or any other paid membership plugin) to enable paid membership (in example to charge a fee for premium broadcasters or accessing certain channels). With the Paid Membership plugin, users can buy membership using same token system used for tips and pay per minute (MyCred and/or WooWallet + WooCommerce). WooCommerce Subscriptions Setup subscription products, content. Leverages Membership plugin to setup membership subscriptionsSetup at least 1 paid role that members get by purchasing membership. This script benefits from power of WordPress (most popular site framework powering many of top sites), reliability, ease of use, plugins, themes, a large community of experienced developers and designers, scalability, performance, high quality coding and security standards. WP is the top platform of choice for top 10 000 sites: About 30% of top 10k sites online use WordPress. VideoWhisper developers can build custom simplified iOS or Android apps that fit mobile screens and capabilities. Such development is an optional custom service and resulting app can be used in combination with web based solution. Such applications can implement features and interactions specific to these solutions, to match the advanced web interface features (like chat). Applications need to be developed and published for each site, and integrate with web based part depending on exact project requirements. Custom applications price range starts from $1500/application. 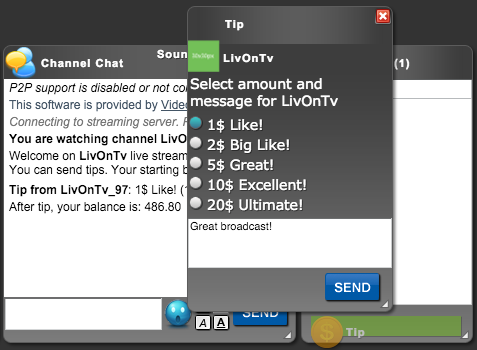 A combo of iOS + Android apps similar to Livon.Tv can be provided from $2000 depending on any custom requirements. Contact with exact requirements for evaluation. Publishing applications in App Store requires Apple iOS Developer Program membership ($99/year) by site/project owner. To test application during/after development, UDID for iOS testing device will be required. Applications can be published by our developers and transferred to new owner or provided to be published directly by owner. When publishing by owner, a Production Certificate and Distribution Provisioning Profile will be required to generate the app zip required on iTunes Connect. When transferring Apple ID and Team ID will be required. Android apps can also be built and transferred. This also requires an account by site/project owner. There is a one time $25 registration fee charged for a Google Play Developer Console account. You must be located in a supported country to distribute apps on Google Play. Source code, if necessary, can be provided for about $2000/app and can be used to create and publish own apps. When building by other developers the new build will be a different app. The new app can be published in replacement of previous app (not as a new version) and original app can be removed. As mobile apps are built using VideoWhisper framework and based on Adobe Air, features can’t be added to other apps built using other frameworks. Integration with other apps and mobile sites ca be done using custom URL schemes to call app and automatically trigger certain functions (in example access a room with a link like v2wvc://call?room=Lobby). Viewers can send tips to broadcasters from watch interface. This is based on myCred credits that can be purchased with real money. Tip shows to everybody in chat (with a sound notification) but client can write a custom private message that shows to broadcaster only. Tip dialog can be opened from Send Tip button available in users list panel. Webmaster can also define the ratio earned by broadcaster from tips. 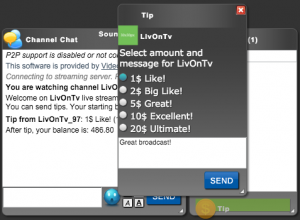 Broadcaster can receive the full amount or just part of the tip amount (default: 90%). Schedule videos to play as live streaming channels. For on-demand stream sources, use either 0 or a positive number for the start parameter. A positive number will start that number of seconds into the video. To play the source until the end, use -1 for the length parameter. Any positive value will play the source for that number of seconds. To loop through the schedule, set repeat to true. Setting repeat to false will shut down the stream after the playlist has finished. Later playlists aren’t loaded unless they start before the non-repeating playlist ends. Set the scheduled parameter to start the playlist at a specific time. If the begin time is in the past, each playlist is loaded in order and immediately replaces the previous playlist for the stream. Broadcast live video from your site, have full control of access and content. Stream unlimited channels. Setup your own membership, advertisements and rules. This solution is powered by VideoWhisper Live Streaming, Video Share VOD and WordPress framework .